Arsenal Tickets - Safely Buy Your Tickets 100% Guaranteed. Arsenal Football Club is one of most successful teams in the history of English football and remain consistent perfomers in the Barclays Premier League. 2015-16 will be Arsenal's 89th consecutive season in the top flight of English football and since French manager Arsene Wenger joined the club in 1996 the club have remained perennials in the much-vaunted 'top four', qualifying for the UEFA Champions League every season since. Lovingly known as the Gunners due to their being formed by military forces workers and the distinctive cannon crest, the club has a historical rivalry with fellow North London club Tottenham Hotspur and has developed a heated rivalry with Manchester United, Chelsea and Liverpool since the 1980s. Arsenal football tickets are usually in extremely high demand with Arsenal fans and neutrals alike and their free-flowing and attacking style of play is often admired by opposing fans. The club was founded in 1886, initially as Royal Arsenal and then more famously as Woolwich Arsenal. By the 1930s, with Herbert Chapman as manager, Arsenal had early success with two league titles and an FA Cup. To date, they have amassed 13 league titles, including two Premier League wins, have also won the FA Cup a total of 10 times. Wenger's 2003-04 title-winning squad managed the phenomenal achievement of going unbeaten in the league for the entire season; in fact, the team - known as 'the Invincibles' for this feat - managed 49 league matches without loss. In Europe, Arsenal Football Club have a consistent presence in the UEFA Champions League, and were finalists in the 1999-2000, becoming the first English team to reach the final. In 2015-16, Arsenal will embark upon their sixteenth consecutive season in the group stages of the Champions League, a record unequalled by any other English club. Of the club's current line-up, newly-signed goalkeeping legend Petr Cech is sure to be a reassuring presence at the back of the pitch. Captain Mikel Arteta is part of a remarkable attacking force, rotating appearances with England international Alex Oxlade-Chamberlain, Santi Cazorla, Mesut Ozil, Theo Walcott, Olivier Giroud, Danny Welbeck and the immensely talented player Alexis Sanchez. Their current record signing is Mesut Ozil, costing the club a reported ₤42.5 million; however Wenger has been adept at growing talent from within the club's ranks andr developing talented youngsters. Notable successes in their youth squad have been Ashley Cole, Nicolas Anelka, Cesc Fabregas, and perhaps the most celebrated player in their recent history, Thierry Henry. The French winger-turned-striker broke club legend Ian Wright's goalscoring record by scoring 228 times for the club between 1999 and 2012. Following Herbert Chapman have been a succession of managers who have reinvented the club and brought trophies to North London throughout the 20th Century. Title-winning managers since have included Terry Whittaker, Bertie Mee and, more recently, George Graham. Becoming manager in 1986, Graham won the FA cup in his first season in charge, following up by two titles, two further domestic cups and the European Cup Winners' Cup. Their current manager Arsene Wenger has been at the helm for nineteen seasons, and has revolutionised the club with a string of imported signings, new training and dietary methods, and has been involved of every step of moving the club from Highbury to its current home, the Emirates Stadium. After almost a century at Highbury in Islington, Arsenal moved to the nearby Ashburton Grove in the newly-built Emirates Stadium in 2006. The new ground added almost 20,000 seats to what Highbury could offer, with a seated capacity of 60,355 fans. Named after their long-time sponsors, the stadium was opened in July 2006, with the first match played aa a testimonial for the Dutch forward Dennis Bergkamp, a lynchpin of Arsenal's early success under Wenger, against his former club Ajax. In 1932, the London Underground station Gillespie Road was renamed 'Arsenal' in the club's honour - still the only tube stop to be named after a football club. Arsenal FC: did you know...? Fans of the club are often known as 'Gooners', and the leading Arsenal fanzine is named 'The Gooner'. The club's home strip colour choice of red is in recognition of a donation made by Nottingham Forest early in Arsenal's history, when two of Royal Arsenal's founding players asked a favour of their former club, and Forest duly sent back a redcurrant-colour set of kit. Initially meant as a jibe of the club's perceived 'boring' style under George Graham, the chant of "one-nil to the Arsenal" is now sung by Gooners to reinforce when their team are playing well! ...and in 1937, a friendly match between the Arsenal first team and reserves was the first ever televised football match. To complete a hat-trick of media firsts, the April 2010 Premier League clash with Manchester United was the first sporting event to be broadcast live in 3D! The first edition of Match of the Day in 1964 included highlights of Arsenal's match against Liverpool. The author Nick Hornby's first book was an autobiographical account of his life as an Arsenal supporter, and was also a movie starring Colin Firth. Other notable Arsenal fans include Idris Elba, Dermot O'Leary, Karren Brady, Matt Lucas, David Miliband, Piers Morgan... and, most surprisngly of all, Queen Elizabeth II! The womens' team Arsenal Ladies usually plays its home games at Boreham Wood, but they play at the Emirates once a season. Buy Arsenal football tickets at Ticket4Football! 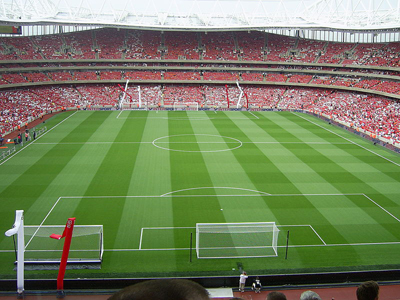 If you are looking to buy Arsenal tickets for this season at the Emirates Stadium, then order now at Ticket4Football. Tickets are always in great demand and you can rely on your purchase to be secure. For the latest Arsenal FC News to our blog.